At Paul Thiebaud Gallery in San Francisco, painter Christopher Benson is currently showing a suite of paintings that feature contrasting settings and themes. One cycle of recent paintings is set in Berkeley; there is one exterior depicting the side yard of the Benson family's former home, and three views of the artist's wife Cybele posing in the house where she grew up. 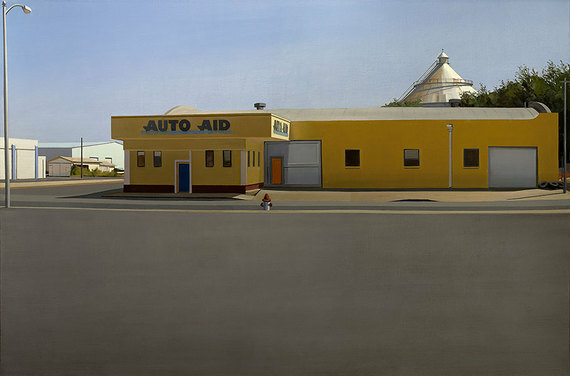 The Quilter's Daughter, 2012-2014, oil on linen, 48" x 96"
Another group consists of four paintings of a three-block section of a partially abandoned industrial/commercial district in the city of Roswell, New Mexico. 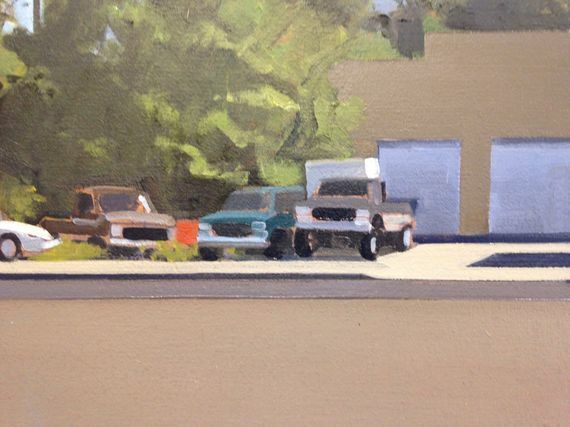 According to Christopher Benson all of the Roswell paintings represent "one day in that location on a very hot morning and afternoon in June of 2013." There are also two earlier works on view: one depicts the artist's wife and son in a Rhode Island interior, and another shows Cybele having her hair hennaed by a friend in Berkeley. 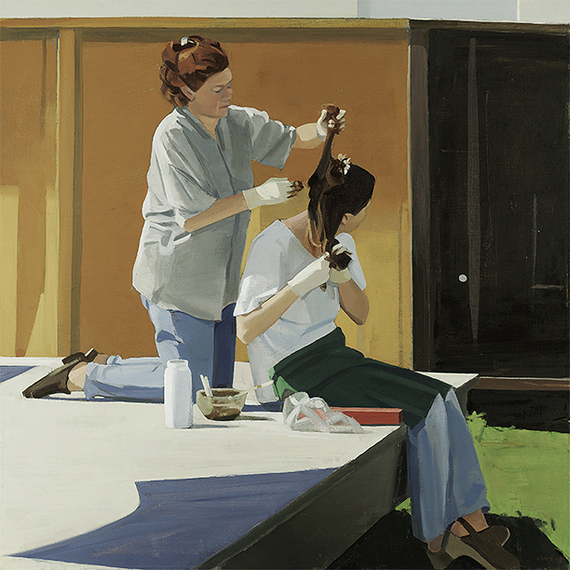 Henna, 2005, oil on linen, 26" x 26"
Considered as a whole, Benson's show is an essay on visual clarity. 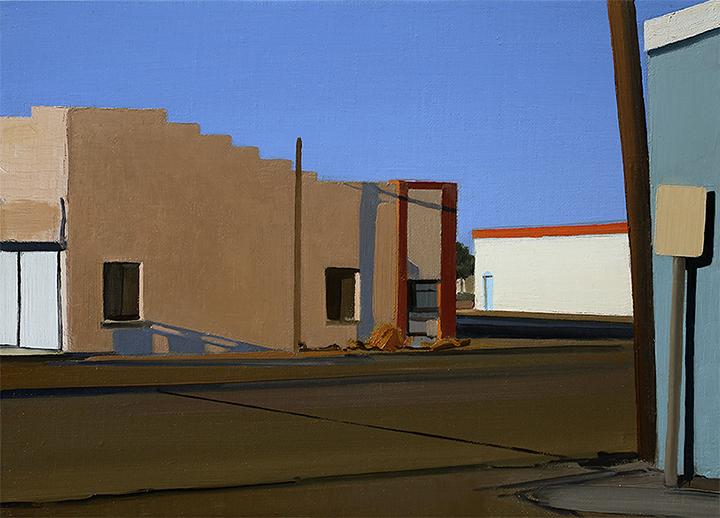 The artist's solid, reduced brushwork shows his efforts to deal with the essential in order to harmonize his subjects. As a result the emotional tone of the show is both subdued and inviting. 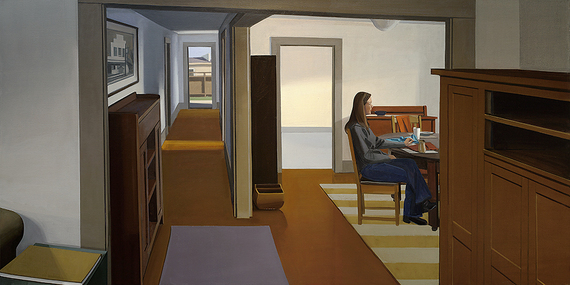 In a short essay written for the exhibition catalog Benson discusses his approach: "All these paintings together reflect my desire to reduce some essential visual and emotional response to subjects that are often far more cluttered and complex in real life; despite their seeming realism, they are more like memories than exact records of what I saw." Looking over the surfaces of Benson's paintings I kept it in mind he worked as a cabinetmaker in his 20s and 30s. 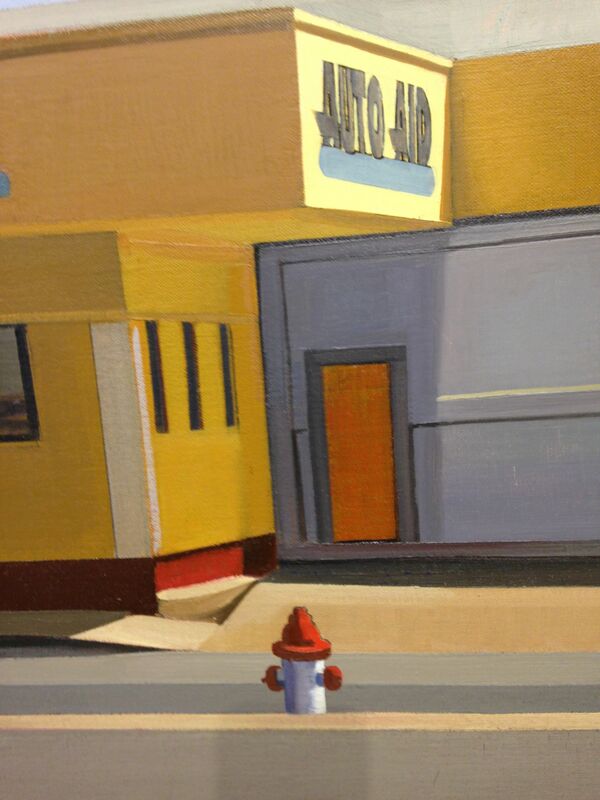 In both his interior and exterior scenes Benson has a firm awareness of structure and architecture. His forms are carefully carved by light into planes that imply firmness and weight. 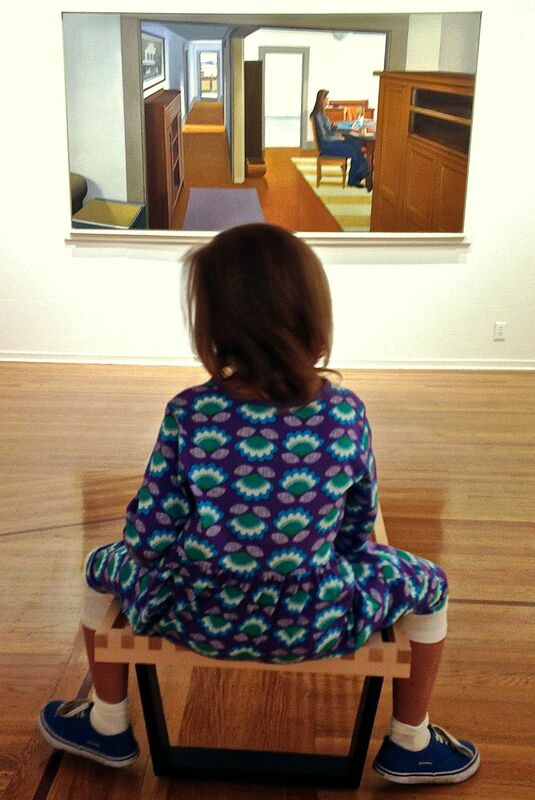 Even with a brush in his hand, Benson has a carpenter's sense of structural rectitude. 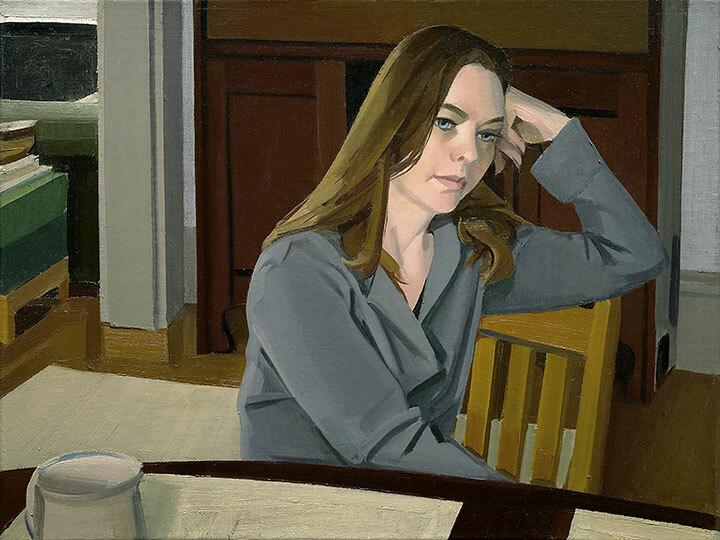 In his interior scenes Benson plants his figures firmly in their painted worlds in a way that hints at a certain sense of restraint. One of the artist's stated themes, when painting his wife, is to show "how she is ultimately isolated, as we all are, inside her own experience." Grey-Eyed Athena (for Mark Edmundson), 2013, oil on linen, 12" x 16"
Seen from a few steps back Benson's paintings radiate order, serenity and singularity of vision. Seen at close range the artist's hand and brush are very much present: he isn't in any way a Photorealist. 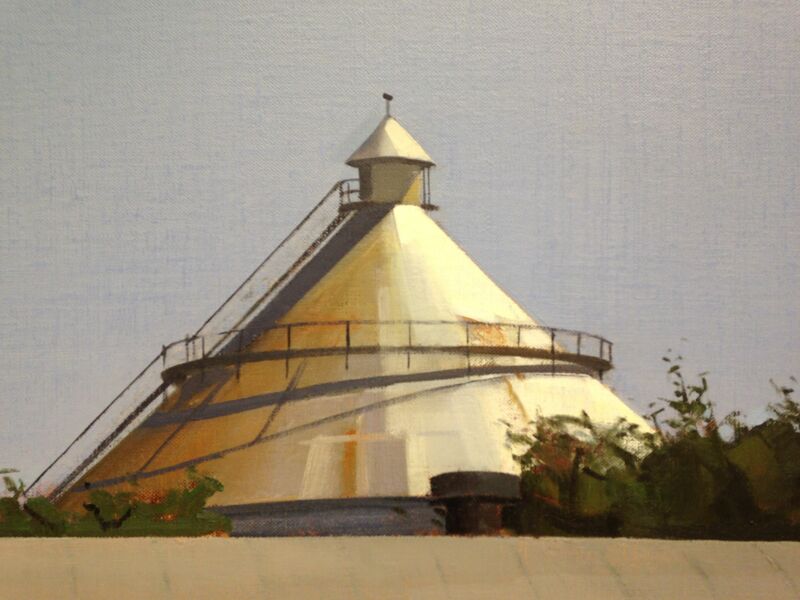 In his catalog essay, Benson opines that "... in the end, every painting is put together by the eyes and hands of its maker, wrestling the primitive alchemy of colored earths and oils." 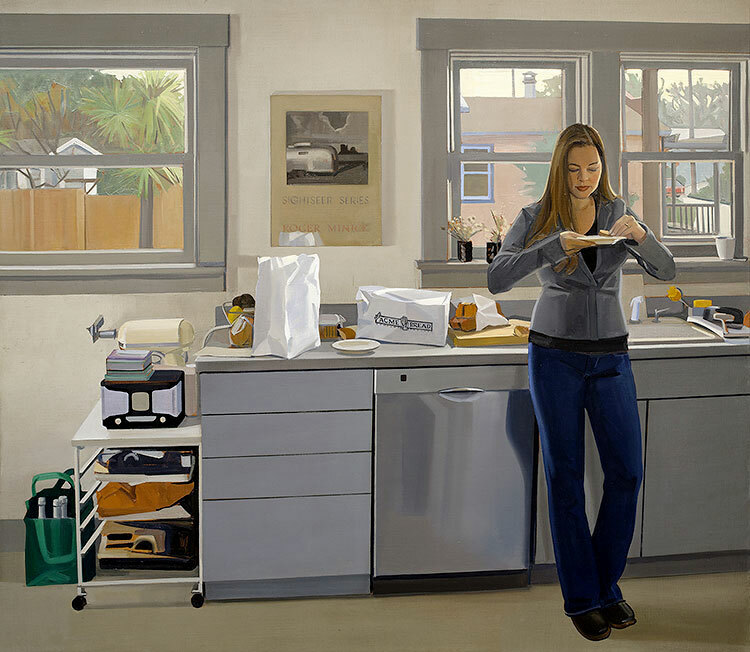 Roswell 8, 2014, oil on linen, 22" x 36"
INSIDE and OUT is a beautiful and very honest show: it looks superb in the Thiebaud Gallery's perfectly lit spaces. Don't go expecting to be knocked out, but do go expecting to see a show that quietly says more than you might at first expect. 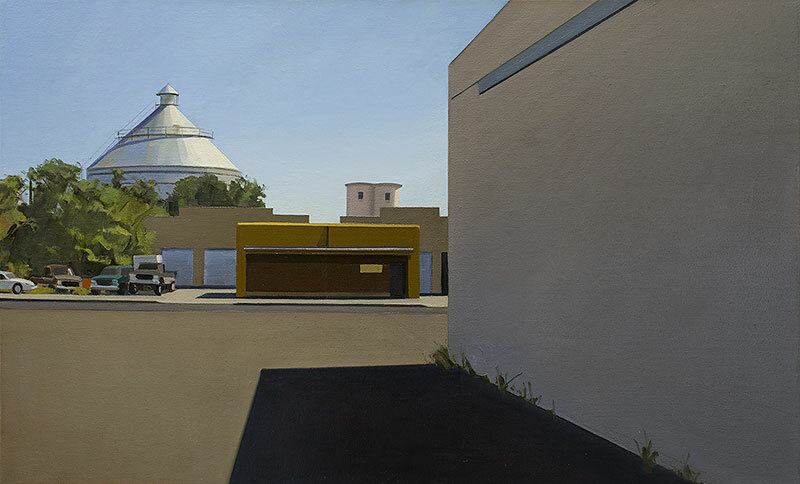 ACME Bread, 2014, oil on linen, 42" x 48"
Roswell 2, 2013, oil on linen, 10" x 14"